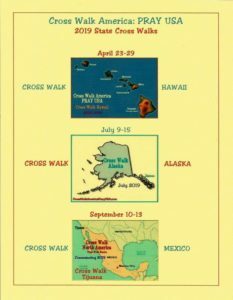 In 2019 Street Evangelist Tom Alexander will take the long cross to Hawaii, Alaska and Mexico. Hawaii will be state #40 that I have cross walked at each state capital and major cities of these 40 states as well. Alaska will be state #41. In 2020, I will bring the cross to the nine remaining Eastern Seaboard states, as well as taking the cross to The White House, Capitol Hill and the Supreme Court, hoisting that 10-foot, 60-pound cross upright and praying for great revival, great awakening and great repentance throughout the land. 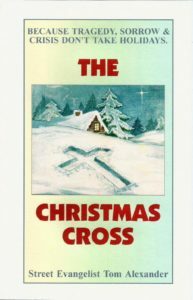 Because I have to fly to both Hawaii and Alaska, I will not be able to bring the cross. so I will build a cross at each capital city, walk the cross throughout the city and state, and then leave the cross with someone would will pledge to take up the cross and regularly walk the cross and pray for that state. 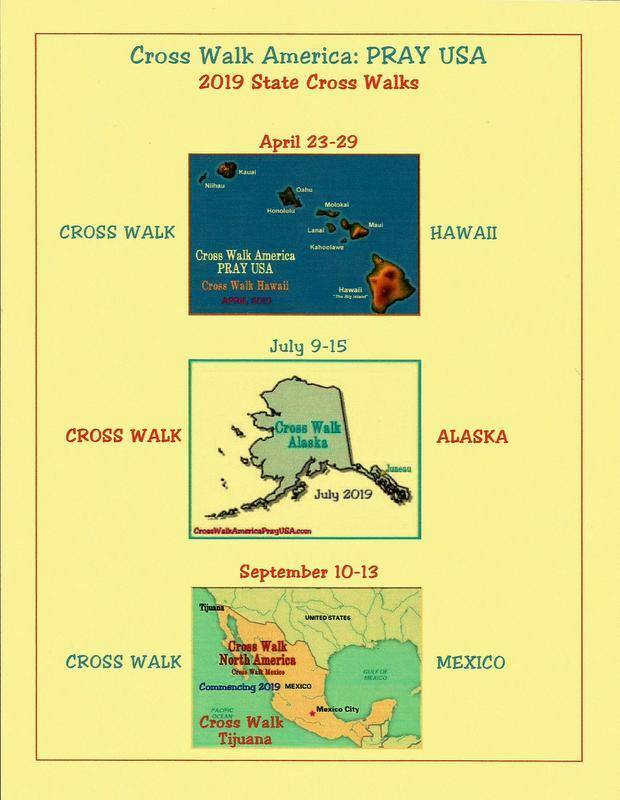 My goal in Christ is get one individual from each of our nation’s 50 states who will each began a cross walking ministry throughout his respective state. 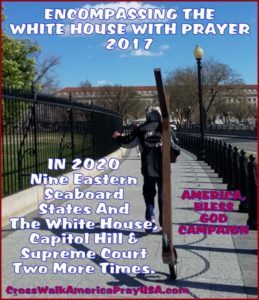 I will walk the cross throughout the remaining nine Eastern Seaboard States, including New York, New Hampshire, Connecticut, Rhode Island, Vermont, Delaware, New Jersey, Massachusetts and Maine, as well as Washington D.C. two more times during this very important national election year. This includes cross walks at the White House, Capitol Hill and the Supreme Court of America. Between the two state cross walks in 2019, I will also begin cross walking Mexico, starting at Tijuana and eventually bringing the long cross to Mexico City, as well as bringing the cross to other California cities. 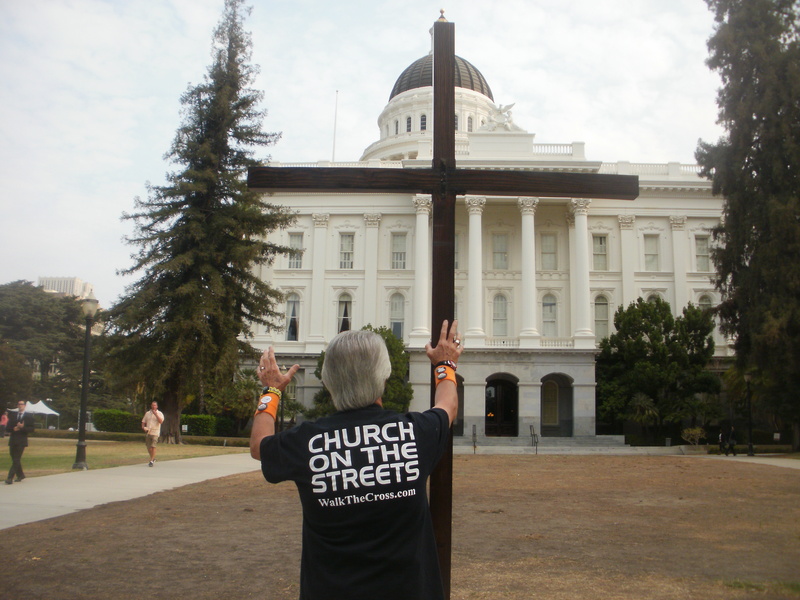 So far, I have walked the cross in 140 California cities, and will repeat cross walks in Los Angeles, San Francisco, Sacramento, Oakland and San Diego as well. I am excited about 2019’s cross walks, including this initial ministry incursion into Mexico. My prayer is that hundreds of thousands of Mexicans will accept Jesus Christ as their personal Savior and Lord as well in the next couple of cross walking years throughout this great nation. God is not willing that anyone should perish or be separated from Him for eternity. He proved His love for humanity when He sent Jesus Christ, His only Son, to die on the cross for our collective sins. God’s message of love is quite simple. 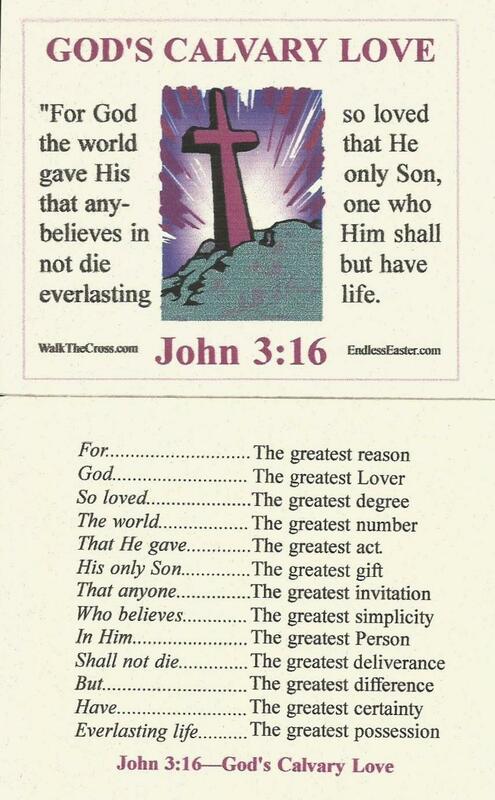 John 3:16 tells us the simple yet everlasting message of eternal life in Christ Jesus. These cross walks are all about sharing God’s love in Christ, and praying for great revival, great awakening and great repentance that produces godly sorrow. The love of God is greater than our sin. His grace is amazing. And His gift of eternal life is free to all—simply by accepting Jesus Christ as the Savior who died on the cross for our sins, confessing Jesus as Lord, and believing in our hearts that God raised Him from the dead, which is the proof that God is the giver and Lord of eternal life. Why not give your life to Jesus today! If you have questions, contact me at Tom@WalkTheCross.com. 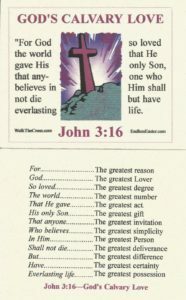 John 3:16 explains it all concerning His amazing love for you and me!. 2020 will prove to be much more than a major political election year. The LORD of angel armies has revealed that the start of nationwide great revival, great awakening and great godly sorrow that produces godly repentance will commence starting in January. The seeds of salvation have been planted by third day believers all across our nation, and harvest time is now upon us. This great revival will not take place because of America’s righteousness, but because of the grievous sins of collective America. Such is the love of God! In spite of our collective wickedness, the God of truth and justice continues to have great compassion on the United Sates of America. 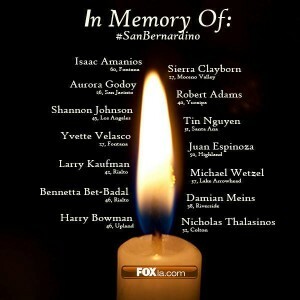 Let us all begin a season of prayer for the 320 millions souls living in our nation! Th e young boy glared at me as he slowly walked across the street and in front of the “go-ye-mobile” truck I use to carry and prominently display a 10-foot by 5-foot, 60-pound cross everywhere I go and for all to see. I didn’t understand his apparent agitation. I had stopped for him to cross over to the other side of the road and was driving under the residential speed limit. No, I didn’t steal that cross! I made it. 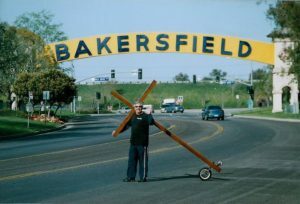 And as I cross walk the streets of Bakersfield (a California valley city Jeanette and I have lived in for almost 30 years)—or the streets of Los Angeles, San Francisco, San Diego and some 140 other California cities so far, as well as bringing that large cross to 39 states and state capitals and other major cities of America so far—the response to the cross of Jesus Christ is always the same no matter what city or state I bring it to. No matter whether the response is positive or negative ( and by far, the response is overwhelmingly positive), it is always the great attractor! For some reason, the large cross demands attention, demands attraction, demands notice, demands observation—and demands response. This greatest symbol of Christianity also demands thought, reflection, consideration, devotion and awe. There is simply something uniquely special about the cross of Jesus Christ. Perhaps it’s because the Babe who was born in a wooden manger on Christmas day is truly whom the Bible and God’s holy prophets of old said He was—Isaiah 9:6’s “Wonderful Counselor, Mighty God, Everlasting Father and Prince of Peace—the great God and Savior Jesus Christ! And perhaps that’s the reason why the cross acts like a powerful spiritual magnet everywhere I walk, drawing and attracting men, women and children to the One who’s arms are open wide and hands outstretched with palms extended for all to see the “prints” of peace. WEEKS OF WITNESS (WOW): JOIN OUR THREE HUNDRED CLUB THROUGH PAYPAL OR BY MAIL TODAY! Street Evangelist Tom Alexander at his hometown’s well-known gateway sign to the city. Cross Walk Bakersfield has been happening since 2006. After reading the following exciting and life-changing stories, you may feel led by the Holy Spirit to help underwrite Street Evangelist Tom Alexander and his Weeks Of Witness (WOW) and Walk The Cross ministries. Every year there is a need for 300 believers to each give a once-this-year gift of $100. Donating a single gift of $100 once a year is an effective and affordable way to help Tom continue reaching souls for Jesus and walking the cross uninterrupted throughout America’s fifty states, including California cities and towns. The Three Hundred Club is based on the biblical account of Gideon and God’s hand chosen army of 300 faith-filled and spiritually-alert soldiers who defeated a hostile force of thousands (Judges 6-8) . Your $100 contribution is easy to make. Just click the orange PayPal donation button located at the top of the side bar or you can use this link. Or send your tax-deductible gift to the address below. 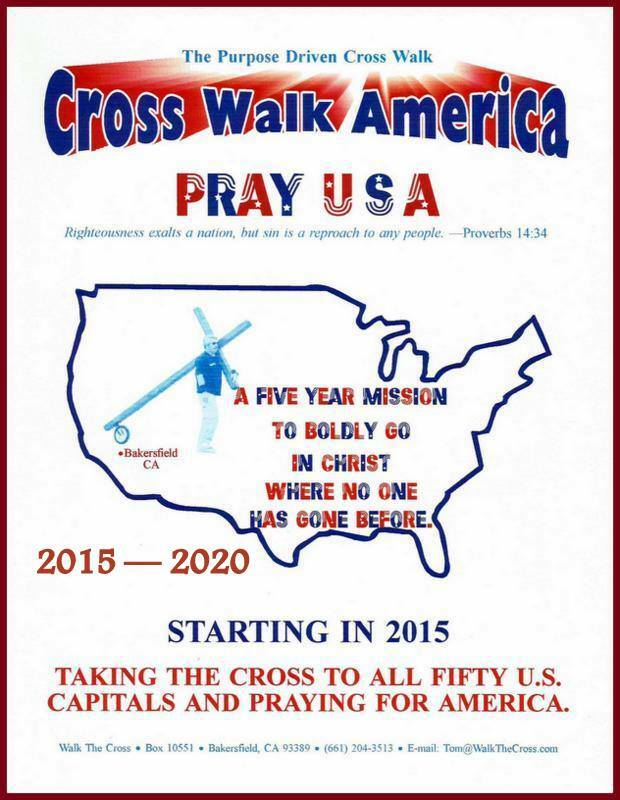 Cross Walk America: PRAY USA. 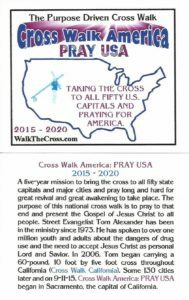 Taking The Cross To All 50 State Capitals Between 2015 – 2020. 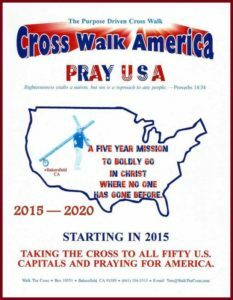 CROSS WALK AMERICA: PRAY USA — Cross Walking Stories From 27 States In 2015, 2016& 2017! Because Everybody Ought To Know! In 2015 (September), 2016 (February-March and July-August) and 2017 (February -March), my wife and I brought the 10-foot, 60-pound cross to twenty-seven state capitals and major cities of those states! 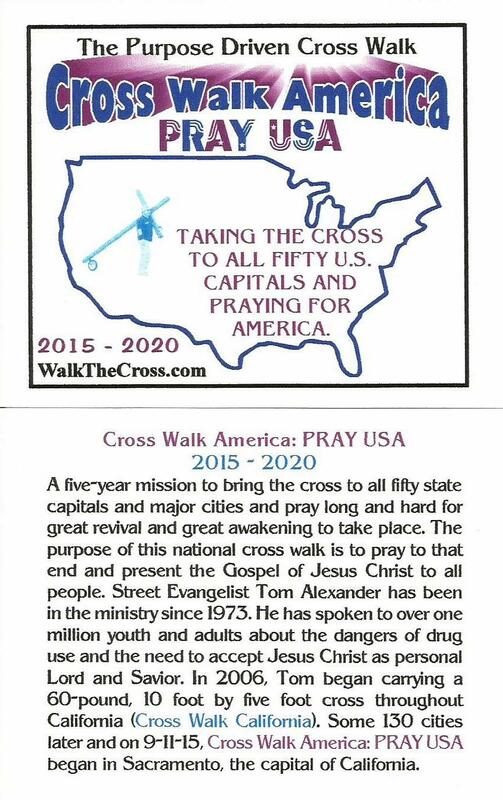 And, in 2018, our plan is to walk the cross in 12 additional state capitals and major cities beginning in March. Of course, there is a very good reason why I am walking the large cross to all 50 state capitals and major cities of America between 2015 and 2020. Our nation is in urgent and dire need of nationwide revival, repentance, great awakening and restoration. Walking the cross a distance of about ten miles per capital and major city, scores of thousands of people from every walk of life got to see a sight they don’t see every day: a cross walker lugging a 60-pound, 10-foot cross throughout city streets and praying loudly and for long periods of time for the people living in these strategic areas. And God’s power was always released and felt by many individuals at each of the cross walks. 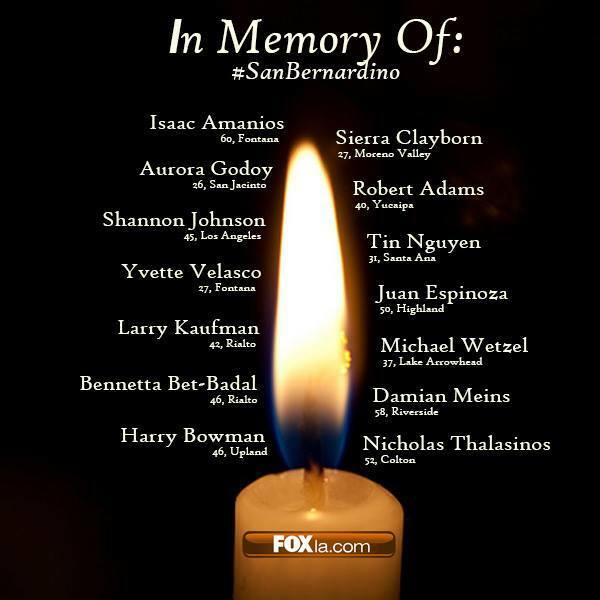 Response to the large cross in each of these twenty-seven states was very similar. Everywhere we brought the cross, and even as we traversed the freeways and highways in our bright red Go-Ye-Mobile truck from state to state and city to city with the large cross resting inside the truck bed and securely and snugly against the customized truck rack for all to see, people’s hearts were filled with joy as God’s Holy Spirit powerfully reminded each believer (as well as nonbeliever) just what Jesus the Messiah had done for all humanity when He died on the cross some 2,000 years ago. 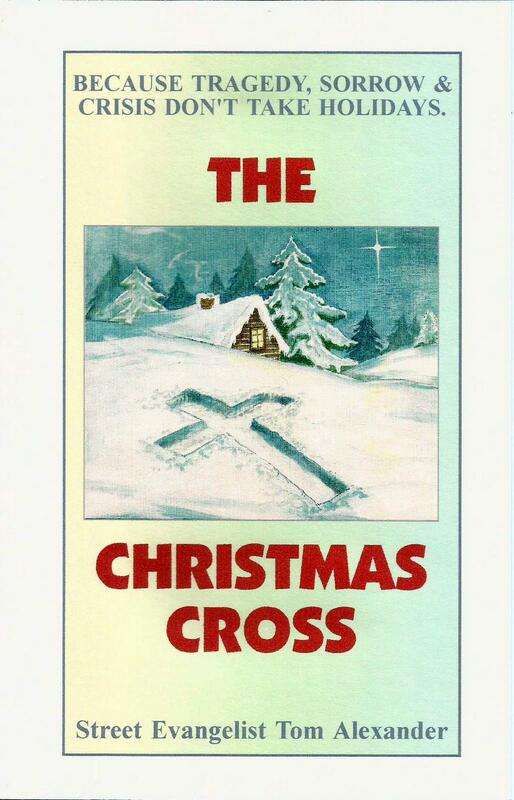 And, as I walked the large cross from our motel room to the Capital Malls and downtown areas of these twenty-seven state capitals and each state’s larger cities, the response was always very positive and often very powerful, as well as heartfelt. The cross of Jesus Christ is God’s Plus Sign To America! Not one thing negative, but all things positive about His cross and the reason the great God and Savior had to die on the cross for the world’s collective sins. 2015, 2016 AND 2017 AND SHARES EXCITING EVENTS THAT OCCURRED DURING EACH WALK. The Beautiful Snake River Runs Parallel With The Highway We Traveled On To Boise. 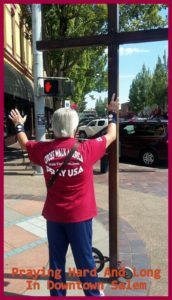 After a great cross walk in Olympia, Washington and a good night’s sleep, Jeanette and I headed southeast and toward Boise, Idaho, some 535 miles away. 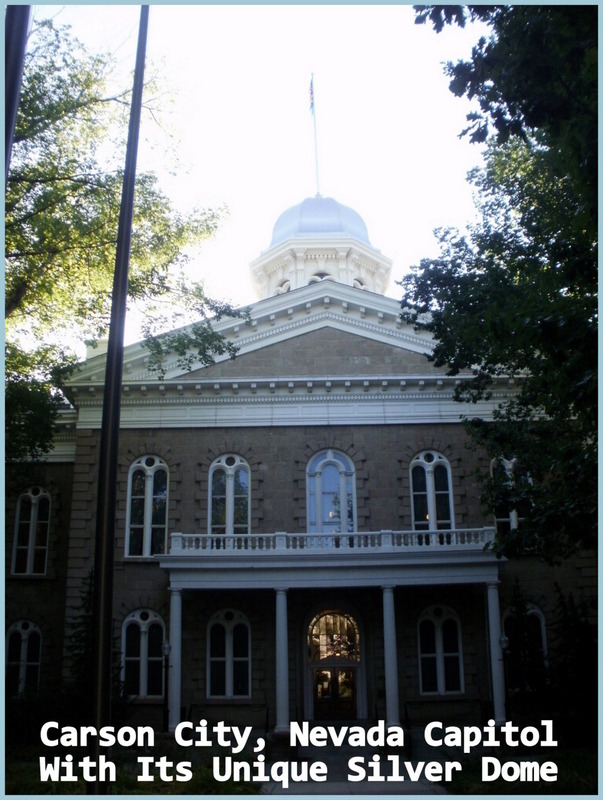 The drive was very pleasant and the scenery was beautiful as we traveled through eastern Oregon and to Idaho’s state capital. Resting for the night, we couldn’t help but reflect upon God’s goodness to the people living in the states and state capitals we had cross walked in the past few days. Although each of the states was small in total population compared to our home state, California, we understood fully just how important it was for every person living in the United States to know just how much God loves each and everyone by sending His Son, Jesus Christ, to die for our sins and to give eternal life to all who accept His free gift of salvation simply by accepting His Son as Savior and believing that Jesus Christ is the Messiah. After praying at Oregon’s state Capitol Mall in Salem, as well as the downtown area, I returned to our motel. Jeanette and I checked out of the motel, then headed for Portland for an entire day of cross walking. You can read about the awesome Portland Cross Walk by returning to our Home page. After a special cross walk in Portland, which was prompted by TV and newspaper reports that the city’s largest gang was targeting police for assassination, we headed for Olympia, the capital of Washington and just an hour away. As we left Oregon’s most populous city and entered Washington state, we were greeted by a large sign that also bore witness to why we were walking the cross in the state of Washington. The sign made us smile because everyone entering Washington from Portland sure can’t miss reading God’s Good News about our Savior’s crucifixion on the cross for our sins, His resurrection from the dead, and His soon return. And, as we would find out later, there are many believers living in the Evergreen State. But we would also soon discover that the state’s beautiful capital city also had some major problems. Shoot Dope, Skip Rope, Eat Cantaloupe. A Not So Normal Guide To Getting High. In 2012 Washington’s citizens voted to legalize the recreational use of marijuana, aka cannabis. Since then there has been an upsurge in the number of marijuana-related fatal car crashes, reported in a 2016 article in the Washington Post and according to a new study by the AAA Foundation for Traffic Safety. No doubt, this and other safety issues concerning the legal use of cannabis products will eventually show that marijuana is not a safe and benign drug, as many pro-pot proponents tout. For now, cannabis is legal to use in this state by those over 21. But, of course, we all know that this dangerous drug is most certainly used by those under twenty-one as well. When we checked into our motel room I noticed that, along with many other sight-seeing brochures and visitor’s guides situated inside a large wooden rack, a colorful guide and map to the state’s licensed cannabis shops was also included. One of the reasons we had come to Washington was to pray that the people of this beautiful state would choose to say NO to using drugs, including marijuana and other cannabis products, even though it is legal to do so. Our latest 8-state cross walks began with Salem, the capital of Oregon. 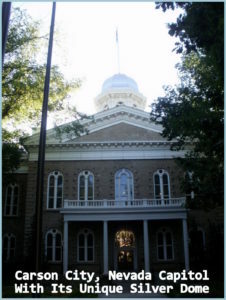 Between 2015 and 2020, my wife and I will travel to all fifty states and walk the cross at each state capital, Capitol Mall, City Hall and Police Stations and hoist the cross upright at each place and pray long and hard for all the people living in that state, including its governor, state representatives and senators, city leaders and the state’s Thin Blue Line of law enforcement officers. As is usually the case, Jeanette and I try to stay at a motel within a few miles from each Capitol Mall and downtown area. I love walking the cross down the major streets and thru the residential areas leading to each Capitol building. I get to talk with and pray with the everyday people this way, and hundreds of people get to see the large cross before I make it to my destination. Arriving in the afternoon in Salem on the 20th of February, we checked into our motel room and spent a peaceful night plotting out my route for the next day, as well as discussing the previous cross walk in Redding, California, where we had spent ministering 1½ days prior to driving to Salem. I slept soundly this night, until 4 o’clock in the morning. For some reason, I was wide awake. I felt very fresh and rested, but though I do get up early, this is not the usual time that I arise. And, just like that, a very familiar Scripture from the Bible flashed like lightning across my mind. This Carson City cross walk is the last of eight state capitals and Capitol Malls Jeanette and I brought the ten foot, 60-pound cross to this past July and August and during the second segment of several 8-state cross walks throughout America and our nation’s fifty state capitals and Capitol Malls, which will take place between 2015 and 2020. This most recent 8-state cross walk took place from July 19 to August 4, 2016. AND, of the eight state cross walks, this one was quite amazing in Christ!